Playing footsie when you are sitting behind the wheel of a car should be considered a no-no, but if you are in a hybrid vehicle, it can be very rewarding. A bit of foot juggling will bring out the best in economy and emissions. And as this is the reason one would buy a hybrid in the first place, it is pay-back time at the fuel pumps if you perfect the art of gently nudging the accelerator. This is a one-foot dance as you are dealing with automatic transmission. To get the best from hybrid technology you have to learn new habits and pay attention to the dials showing the battery charging, battery and engine combined are in driving mode or the engine driving at full throttle. With a light touch, no hard revving, it is possible to spend a big part of the journey in battery-only mode. Braking, unlike in petrol-only powered cars, regenerates the battery and actually saves money as you constantly extend the battery life. Driving downhill with the lightest touch on the accelerator will also show the battery pack charging. Using cruise control on long journeys and accelerating slowly will help and when the cold weather comes keep the car in a garage, if possible, to protect the battery. In the new hybrid powered Ford Mondeo fuel consumption on a trip to Wexford and back varied between 5-litres/100km and 5.5-litres/100km and that included driving at 120kmh on motorways. 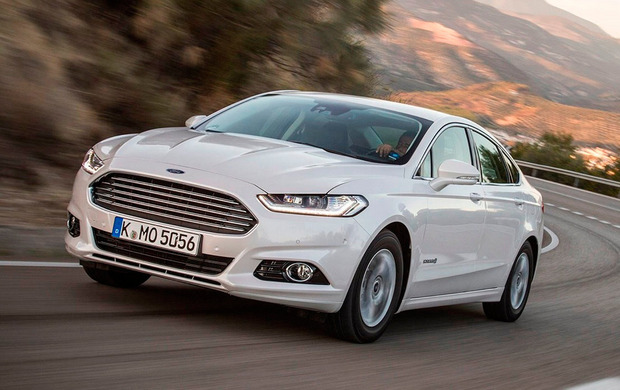 An equivalent two-litre diesel Mondeo, costing thousands of euro more, would trail behind at 5.9-litres/100km in real-world terms - so anticipating traffic ahead and a light touch in a car with hybrid technology could well be the death knell of diesel. To get the best from hybrid technology takes patience, learning new tricks to cut down on fuel, like keeping in the 'slow' lane as much as possible, and anticipating traffic ahead. A heads-up display would be a great benefit when monitoring the driving mode dials without the dangerous distraction of looking down to the fascia. This is cheap technology now, so it should be a "must" in hybrid, if not all cars. Check this out - HUDs can be bought online as an accessory and will work when plugged into the diagnostic port just under the fascia but be sure it will show the hybrid functions you are looking for. The Mondeo HEV is based on a four-door body style with a two-litre 187bhp petrol powertrain and there are Titanium and Vignale trims at €32,745 and €35,280. At launch, these prices included promotional and government VRT discounts. Two electric motors boost engine power by helping to drive the wheels, regenerating the battery, for a top speed of 135kmh. The makers say it is a lot more frugal at the pumps than a comparable two-litre 150bhp diesel with automatic transmission - Ford's figures are HEV, 4.2-litres/100km; diesel, 4.8-litres/100km. Eddie Cunningham I'll turn an old adage slightly on its head this week, if I may. It is said that a picture paints a thousand words but, I believe there are words that can paint several scenarios, too.